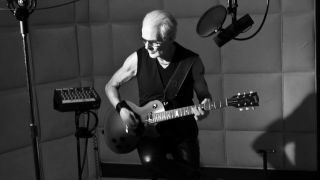 Michael Des Barres just might be the ultimate journeyman performer. Before his current dual career as a solo artist and host on SiriusXM's Little Steven's Underground Garage, the British-born singer fronted the bands Silverhead, Detective and Chequered Past, and he stepped in as the vocalist for The Power Station after original singer Robert Palmer bowed out. Long before he rocked the mic, Des Barres first became known to international audiences when he shared the screen with legendary actor Sidney Poitier in the classic film To Sir With Love. And his fame caught another wave in the '80s with a featured role in Clint Eastwood's Pink Cadillac and a recurring part in the hit TV show MacGyver. Of I Want Love To Punch Me In The Face (which you can hear below), Des Barres says, "I believe that the majority of people find relationships almost impossible and the result of that is going into a love coma. We fall asleep because we find it so difficult to connect. Connectivity is everything today. In order to do that, you need an identity. You need to know who you are and the phrase 'I want love to punch me in the face' is a metaphor for true love to wake you up out of your slumber and find that perfect soul mate. So let's get in the ring and start punching!" The Key To The Universe will be released April 7. You can re-order the album at iTunes.